What makes Eidon Ionic Minerals special? The proprietary methods of manufacturing our high quality mineral line creates an easy to use, pure and odorless liquid that has superior bio-availability. Our minerals are made in America and manufactured on site with strict quality control. 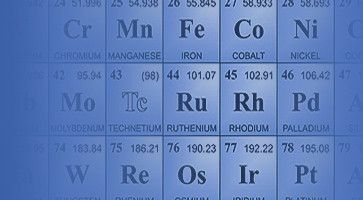 All raw materials are independently tested for heavy metals. The word ionic, when used to describe a mineral element, means that the particle in the solution is separate and individual (an atom) and that the particle has either a positive or negative charge. The charge indicates that there is an incomplete outer electron shell giving the atom the property of being able to bond to other elements. The body readily absorbs elements in their ionic state. How are the mineral products manufactured? Our mineral products are produced in a state of the art manufacturing facility for the bottling of liquid products. Imitating the intricate processes found in nature, these minerals, which are food grade, pharmaceutical grade, or derived from natural sources, are made using a highly technical, proprietary technology to create angstrom-sized, ionic mineral particles and combine them with ultra-pure de-ionized water. These elemental mineral ions can exist in a perfect polar and ionic water-soluble form. The purer the water the more efficiently minerals are activated into their electrically charged ionic state. Our mineral products use water that is purified at the manufacturing facility using a unique, proprietary process which includes ion exchange, ultra-filtration and UV light treatment. The amounts appear small because these water-soluble minerals are 100% bio-available and are fully assimilated by the body. As such, smaller dosages can be used. Will your minerals react with my prescriptions? Mineral supplementation is very safe. However, specific drugs may have specific guidelines for use. It is recommended that, before starting any mineral or nutritional program, you check with your healthcare professional for possible interactions. However, we have seen a positive side effect with our mineral supplements. As mineral deficiencies are corrected, the need for pharmaceutical drugs that mask deficiency symptoms may no longer be needed. All minerals, by definition, are inorganic. Eidon liquid minerals are not sourced from plant material and therefore have no organic compounds incorporated with them. 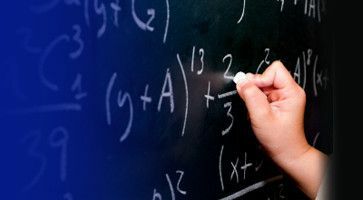 Additionally, we do not add carbon to our formulas. Are there additives, sweeteners or preservatives included? No. Our minerals are simply the mineral and purified water. This makes our products safe and effective for anyone concerned about additional ingredients. With nutrition, we are giving the body what it needs to heal itself and rebuild itself anew and this takes time. To build a better body, we must wait on the natural turnover of the body’s cells. A blood cell lasts 60-120 days. In 3-4 months your whole blood supply is completely replaced. In 6 months almost all the proteins in your body die and are replaced, even the DNA of your genes! In 5-7 years all your bone cells are replaced, constructed entirely out of the nutrients you eat. Think of it this way: if you take a neglected houseplant and start feeding and watering it, the leaves may perk up a bit from the improved nutrition. But you must wait for old leaves to be cast off and new leaves to grow before you get a really healthy plant. Are your minerals safe for pregnant or breast-feeding mothers and infants? Not only are they safe for both mother and child, they are essential for optimal health. Children under 5 will do well on 1/2 the normal dose. Over the age of 5, give them a full dose. Are your minerals safe for my animals, too? Absolutely! All animals also need the additional minerals that are missing from their diets. If you are not sure which minerals they need, you can have a hair analysis done before supplementing. We use the same form and testing for your pets as we do for humans. If you’re submitting hair samples from your pet(s), use the “Occupation” section of the form to let us know. Cross out “Occupation” and indicate ANIMAL HAIR – Dog, Cat, Horse, etc. What’s the difference between the 18oz and 2oz bottles? Eidon Ionic Minerals are available in two sizes: the 18oz regular strength and the 2oz concentrate. The 18oz bottle is a BPA free, HDPE food grade plastic and the recommended dose is one tablespoon. We recommend taking these minerals in 4oz – 8oz or more of water or other liquid. Due to consumer requests, we introduced the 2oz bottle of concentrated liquid minerals in 2005. They are delivered in a cobalt blue glass bottle with a glass dropper. The recommended dose with the concentrates is 30 drops, which can be quickly dispensed as two full squeeze and releases of the dropper bulb. This smaller size is very convenient for traveling, work, or when you only have a limited storage space. We recommend taking the mineral concentrates in 8oz or more of water or other liquid. All of our minerals are available in the 2oz size with the exception of Iron and Manganese. *In most cases, the 30-drop dose is equivalent to the one tablespoon dose of the 18oz bottle. This is not the case with Iodine or Magnesium. These two minerals are more highly concentrated than the regular strength on a dose-to-dose comparison. Do your minerals require refrigeration? No, Eidon mineral supplements do not require refrigeration. Do not freeze the Liquid Silica or any blend containing Silica (Multiple Mineral, Bone Support, and Joint Support) as it cannot withstand freezing temperatures. Once frozen, the Silica’s molecular structure is modified, and it will not go back into solution. We also recommend that you do not drink directly from the bottle as it can become contaminated with bacteria from your mouth. Eidon® Ionic Minerals have a “Best Used By” date of 5 years from production, although mineral elements do not degrade over time. Do you accept Wholesale and Bulk Orders? Yes! Fill out our Vendor Application if you’re interested in adding our minerals to your food and/or skin care formulas, or sell them in your retail store or at your health care practice. We require a copy of your business license, tax ID or certificate/degree showing completion. Why do we need mineral supplements? 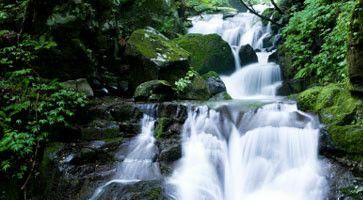 Our bodies are made primarily of water and minerals, both of which are essential to every function within the human body. A proper balance of minerals is required for appropriate function and electrical conductivity. An excess or deficiency of any one mineral can throw the body out of its delicate health balance. When the body goes out of balance, it communicates with you by creating a state of dis-ease. Carbohydrates, proteins, fats, and vitamins are all organic substances – they are compounds of the chemical element carbon. In addition to these organic nutrients, the human body requires certain chemical elements in their inorganic forms, or not bound to carbon. These elements in their non-organic forms are classified as dietary minerals. Before the depletion of soils and the use of synthetic fertilizers and modern manufacturing processes, plants were rich with a usable form of the minerals, vitamins and other nutrients that our bodies need. Now, in order to get the daily requirement of these essential elements, we would need to eat an unrealistic amount of food because the nutrients are no longer there. This is where supplements come in. Water-soluble minerals are unique from other mineral supplements because they utilize a new proprietary scientific technology that transforms insoluble minerals (metals) into angstrom-sized, water-soluble, ionic particles. An angstrom is 1/10,000th of a micron, which is a millionth of a meter. In nature, there are two forms of ionic mineral delivery. The first is mineral rich water and the second is organic plant matter grown in mineral rich soils. The ability of a mineral to be utilized by the body is primarily a matter of size. If you get the particle size of the mineral small enough, you not only get the mineral into the body (absorption), but you also accomplish cell assimilation, which is the key to fully utilizing the benefits of mineral nutrients. Because these water-soluble minerals are not dependent on the digestive or enzymatic functions of the body, they work extraordinarily well for older people and others with diminished digestive capabilities. They are also easier for children and older people to swallow than pills or capsules. Are water-soluble minerals better than pill or capsule form? We believe the criteria for proper utilization and absorption of all minerals, vitamins and other nutrients is dependent on their size and digestibility, also called bio-availability. No matter what the body takes in, it has to “liquify” it in order to be able to use it. The challenge with most traditional pill and capsule supplements is that they usually have been processed with intense pressure, heat, paraffin coatings, and fillers. This “complex” nutrient form is difficult for the body to break down as it is not in the desired form the body needs, water or food. Just because a substance may be present in a compound, does not mean that it can be used. Rust is not a bio-available source of iron, and pennies are not a bio-available source of copper. Although a substance may be present in a compound, it does not mean it can be used. Body absorption of the desired elemental mineral from pills and capsules is often less than 10%, with cell assimilation being almost immeasurable. In addition, pills and capsules require significant digestion before any type of effective absorption can take place. Due to consumption of foods heavily laden with preservatives, inaccurate mineral intake, exposure to environmental stressors, as well as the normal aging process, the digestive capacity of most individuals is significantly compromised. Therefore, mineral supplements provided in pill, capsule, or tablet form provide fractional benefits to the body at best due to their challenges with both absorption and assimilation in the body. Even liquified suspensions are not in a pure design, these are simply a suspension of small particles in water. Grinding up a pill and suspending it in water does not increase its bio-availability any more than putting dirt in water (making mud) increases its bio-availability. When minerals are truly water-soluble, they provide significant health benefits superior to any other supplement form. Why is particle size important to absorption? Chelated and colloidal particles are far too large for immediate cell assimilation in the body. These particles will be caught up in the blood stream and subsequently deposited, building up in various parts of the body. The body’s ability to utilize a mineral is primarily a matter of size and solubility. If the mineral particles can be reduced down small enough, they can then be absorbed by the body without the need for them to be broken down into a less usable form through the process of digestion. The most important issue for absorption of a mineral is making sure it is in its ionic form. The dominant factor is that the mineral must be freed from whatever matrix it is contained within so it can be recognized and taken up by the body. Being in its ionic form helps the body recognize and use the minerals. Can I take too much of a water-soluble mineral? The RDA (Recommended Daily Allowance) of a nutrient is a suggested maximum amount to be consumed each day. Because of their bio-availability, the dosage amount for liquid ionic minerals is less than the RDA since the entire dosage is usable by the body. Remember, body absorption of the desired elemental mineral from pills and capsules is often less than 10%. So, for example, if you take a 500 mg. capsule, your body may only be able to use 50 mg of it at the most. We suggest following the recommended dosages provided on each product. Larger doses should be taken under the advice of a healthcare professional. There are also some minerals that are very powerful and should be taken carefully. For example, iron, iodine and selenium are three elements that should be taken in small doses unless otherwise advised by a health care professional. Mineral elements and gasses are the building blocks of the universe. They do not expire nor go bad when in their elemental state. We have used a 3 year expiration date to this point to establish a benchmark for our distributors and retailers. We are going to change this to a “Best Used By Date” of 5 years from the manufacturing date. In reality, they would be just as effective 100 years after we make them. Can Eidon liquid minerals be used topically? Given the state of our minerals, they can easily be used topically via direct application to the skin and have proven to be very effective in numerous situations. Silica, Sulfur, Magnesium, Zinc, and Immune Support have all shown good healing capabilities when applied topically. We believe topical applications do not take the place of normal supplementation via consumption, but instead are useful for issues involving the skin. Silica is good for sunburns, abrasions, and minor cuts. Other elements have different benefits. “I achieved excellent results with dissolving the calcium deposits on my neck with a daily dose of 375mgs/day. It took between 6 and 9 months. Larger doses will accelerate the process. We know of no toxic dose of Eidon® Liquid Silica. Our silica is sourced from silica sand mined in the southeast U.S. Silica does seem to help stabilize hormone production and regulation in some women and men. Some women have seen improvement in the symptoms of menopause when supplementing with silica. This has not been a universal reaction and we have no idea as to the physiological mechanism at work. There is no scientific research validating or disproving these anecdotal statements. However, all minerals function in the body by catalyzing cellular enzymes. These enzymes control every function of every cell. An optimal balance of all essential minerals is essential for proper cellular function at all levels. Proper hormone levels are directly related to this optimal mineral balance. It isn’t just one or two minerals that control the entire endocrine system. Take a look at our hair mineral analysis program. It is the best way to establish your current mineral status and to obtain direction on what you may want to be supplementing with to reestablish an optimal mineral balance. What is the difference between Silica and Silicosis? *U.S. Department of Labor Occupational Safety & Health Administration Safety and Health Topics: Silica, Crystalline Silicosis is a disabling, nonreversible and sometimes fatal lung disease caused by overexposure to respirable crystalline silica. More than one million U.S. workers are exposed to crystalline silica, and each year more than 250 die from silicosis. There is no cure for the disease, but it is 100 percent preventable if employers, workers, and health professionals work together to reduce exposures. A.This is a good question, which we get asked frequently. Crystalline silica is silica dust. If you are working in an environment where there is a lot of silica particulates in the air and you inhale it you may create problems for your lungs. In reality, if you inhale anything into your lungs other than clean air, you stand the chance of creating a significant lung problem. Smoking is a perfect example. Driving on a crowded freeway is another example. We are not designed to obtain our nutrients via our lungs but rather from the food we eat and the water we drink. Specific vocations expose people to excessive amounts of silica dust. The people who become affected are those who do not take adequate precautions to protect their lungs. Silica in its nutrient form in water or food is a normal and natural delivery mechanism. It is an essential nutrient just like carbon. Inhaling excessive amounts of carbon from burning wood will kill one quite quickly and yet carbon is the second most prevalent element in our body. I hope this answers your question. Drink Eidon® Liquid Silica in good health knowing it is completely safe. What is Eidon Silica Mineral Supplement? 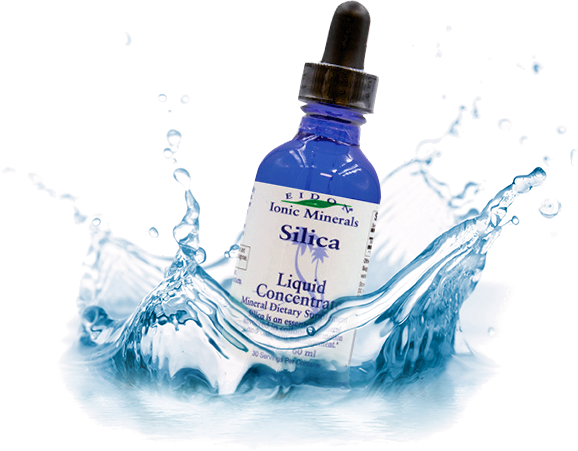 Contributed by Fred Elsner, Chief Chemist, Eidon, Inc.
Eidon Silica Mineral Supplement is a solution of silicic acid, Si(OH)4 in water – the concentration of which is approximately 2.5% by weight (measured as silica, SiO2). Silicic acid is absorbed in the human gastrointestinal (GI) tract and transported throughout the body where it is used in the production and maintenance of collagen and connective tissue. Animal studies have demonstrated that silica is an essential trace element and that a deficiency of silica in the diet can produce dramatic bone and cartilage abnormalities. Note that there is an equilibrium condition between silicic acid and oligomers which means that as silicic acid is removed (i.e. absorbed by the GI tract), the remaining oligomers break down to form additional silicic acid. In this way, Eidon Silica Mineral Supplement will provide as much silicic acid as the body demands. The particle size of the oligomers is less than 10 nanometers which allows them to be readily dispersed in solution. Eidon’s Silica has a faint bluish haze, owing to the tendency of these small particles to form larger agglomerates, which can nonetheless be easily broken down to silicic acid. The bluish haze is created because of the tendency of silica oligomers to reflect the blue portion of the visible light spectrum, similar to air or water molecules. During the production of Eidon’s Silica the pH is adjusted to be very close to neutral and typically lies in the range of pH=7-8 (the typical pH of tap water, eggs or crackers). Silicic acid is completely non-toxic. Is Magnesium a good sleeping aid? Our liquid Magnesium is effective as a sleep aid. Also, one should refrain from eating any refined sugar, flour, or caffeine at least 3 hours before bedtime. Ideally, it’s best to completely eliminate white sugar and flour from a diet. Like the common cold, the origins of insomnia can be mysterious, as sleep can be affected by factors as varied as food and drink, mental state or physical pain. As a natural muscle relaxant, Magnesium is considered the anti-stress mineral. Because it’s naturally calming, it functions to relax skeletal muscles, as well as the smooth muscles of blood vessels and the gastrointestinal tract. To function optimally, Magnesium must be balanced in the body with Calcium, Phosphorus, Potassium, and Sodium Chloride. For example, with low Magnesium, more Calcium flows into the vascular muscle cells, which contracts them – leading to tighter vessels and potentially higher blood pressure. Adequate Magnesium levels help to support a healthy vascular system. Why are the mineral amounts in Eidon’s Multiple Minerals much lower than that found in other multiple mineral products? The recommendations proposed by the National Academy of Science’s for daily mineral intake is based upon incomplete studies and most importantly, what someone should be swallowing. There is normally a big difference between what one swallows and what is absorbed into the cells when a solid mineral compound is used versus obtaining the element its liquid form. One may absorb as little as 5-10% of a solid vs. 100% of an ionic liquid. So, in most cases, you are probably getting more of the particular element in question in a liquid state, even though the label comparison does not reflect it.